Hide & Speak is a ridiculously fun and engaging game best used paired with My Audio Pets hours of fun hiding and finding the Pet with others or using the mic feature. I also got Ice Ice Baby the Penguin is a true wireless-stereo with left/right channel functionality, 3 watt audio that has rich, clear, quality sound, robust bass, 4 hours rechargeable 500 mAh battery, built-in mic for hands-free, easy to click and connect to most Bluetooth devices, works with the hide & speak app. My Opinion: I really like how cute and tiny these are is a fits nicely in the palm of my hand. And the sound that comes from them is pretty amazing and a lot better than I expected. 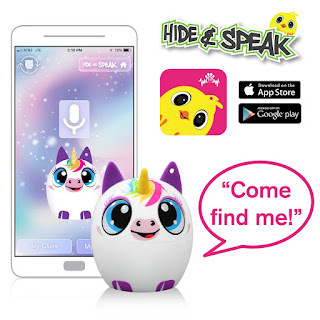 Not only will kids like being able to interact with them but they also enjoy listening to their favorite music through this little speaker.